The University of Nigeria, Nsukka hosts several online proficiency / competency courses that help increase your knowledge in diverse areas of study. These courses have been carefully designed to facilitate enhancements in your knowledge of a field or even introduce you fields that you never would have gone into due to that reluctance of most indiviuals to learn something new as a result of perceived complexity. As you progress in our online proficiency courses, you are presented with specially crafted MCQs (Multi choice Questions), Quizes and Assignments - to test you progress in understanding the course. At the end of a proficiency course, you would have passed all the tests in that course with a full knowledge of what the course taught you. 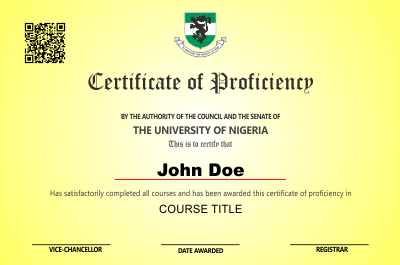 UNN awards you for this achievement by issuing you a Certificate of Proficiency. This shows how much effort you put in the course which is eveident in the certificate issued to you. Get equipped with the practical skills necessary in analyzing and handling the complexities of contemporary issues relating to the chequered nature of the evolution of patterns of relationship among the three tiers/level of government in Nigeria. This course examines the role that ethical, cultural, religious, and moral principles play in the formulation and execution of public policy by lawmakers and other public officials as well as existing issues in domestic and international policy. First used in the 1950s to represent those aspects of public administration and those changes; Development Administration is designed to introduce you to various techniques, guides, principles, practices, etc relating to Development Administration. Paint is a mixture of organic and inorganic compounds into a homogeneous state to give an aesthetic finishing. Learn how to make paint and kick-start a successful paint making business by taking this online course. The Igbo language is spoken by millions of people in Africa and around the world. Learn how to effectively speak and communicate in Igbo language by taking this course. The course has been designed to be interactive, fun and comprehensive.